You know, out of the several dozen Los Angeles landmarks I’ve visited so far, this is one of my very favorites. 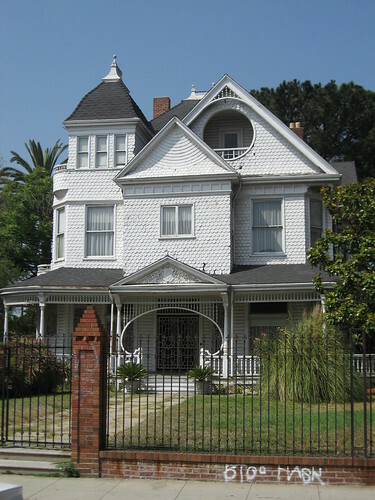 Samuel J. Lewis’s California Style/Queen Anne home was designed by Joseph Cather Newsom (1858–1930), who, along with his brother Samuel (1854–1908), moved from Montreal to the Bay area to open up an architectural firm. Later on, Joseph set up a branch of the company in Los Angeles, in which the firm is credited with more then 650 executed commissions. 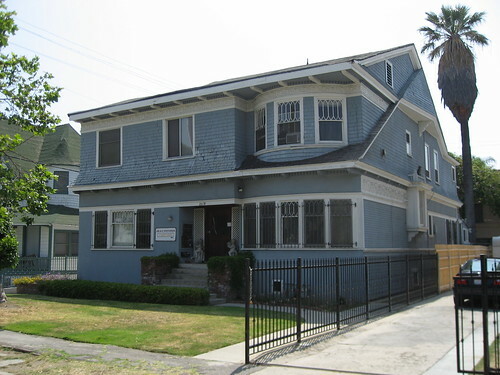 In Paul Gleye’s 1981 book, The Architecture of Los Angeles, he wrote the brothers “were probably the masters of Queen Anne architecture” and that “they built homes one could not avoid looking at”. 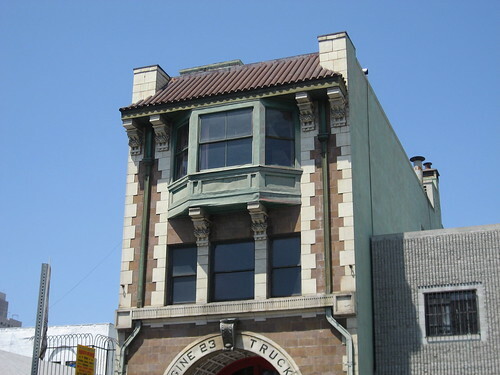 Joseph gets design credit for a handful of other L.A. landmarks, including a couple on Carroll Avenue. 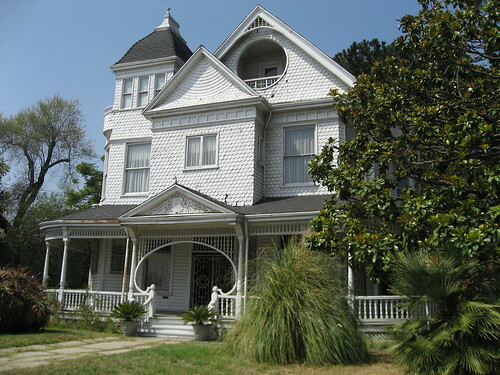 The brothers’ most famous building, though, is the Carson Mansion in Eureka, CA, put up in the mid-1880s. 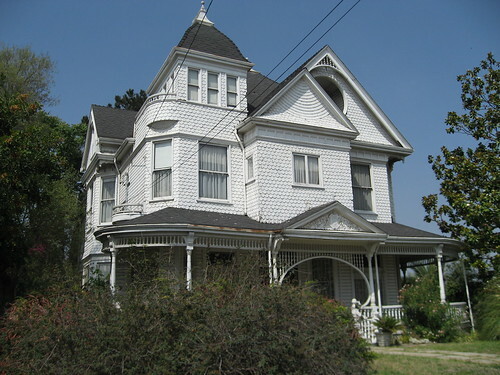 Joseph authored a lot of pattern-books, too, including Artistic Buildings and Homes of Los Angeles (1888), California Low Priced Cottages (1888), and Picturesque and Artistic Homes and Buildings of California (1890). This 300-year-old Coast Live Oak was cut down on August 15, 1975, a victim of, well, death. 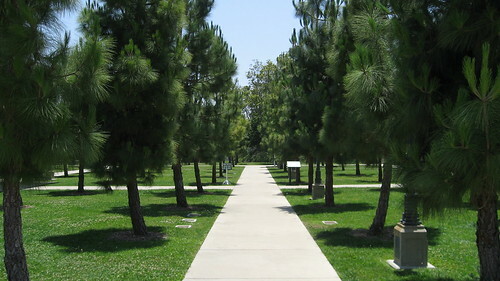 On removal day, the community of Pacific Palisades did what any arboristically-inclined Southern California community would – it held a wake, complete with wine, cheese, and live music. 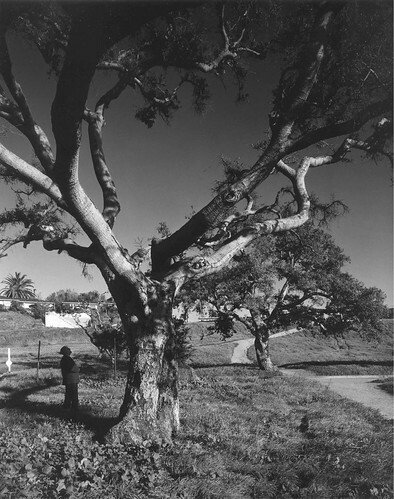 Los Angeles designated the Quercus agrifolia a Historic-Cultural Monument because it was under/around this tree that folks gathered on January 14, 1922, to select Palisades lots for sale. The photograph is from the city's Department of Planning website. 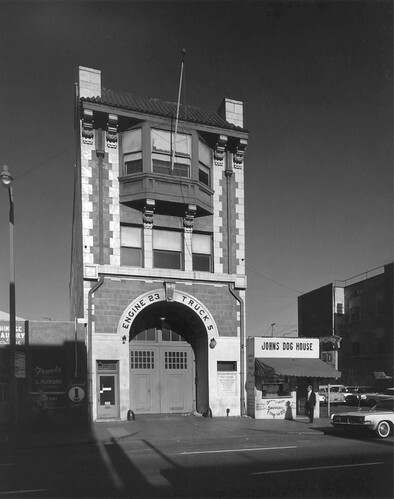 This Renaissance Revival firehouse was heralded when it was built in 1910 for its combination of living and working spaces. 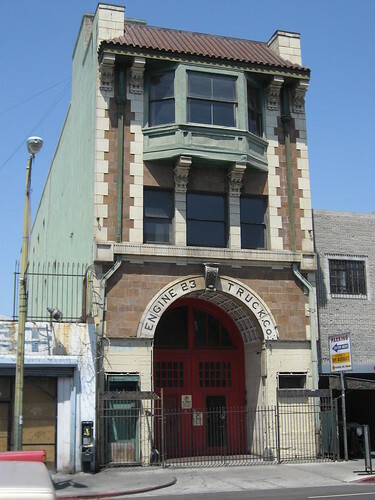 It was retired from active service in 1960, when it became training headquarters for the LAFD. 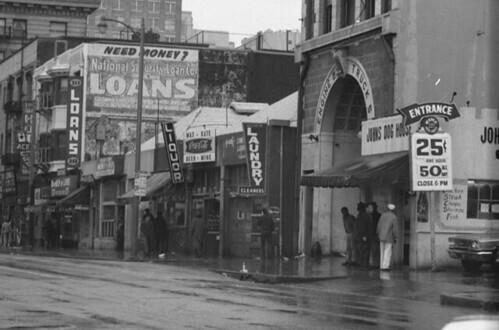 TARGET AREA--The 200 block of E. 5th St., east of Los Angeles St., is one of prime targets in $100 million attack on Skid Row. 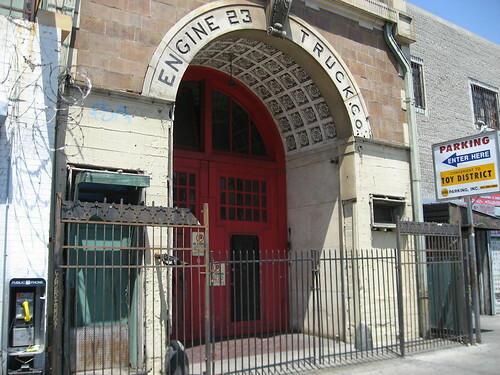 At right is deactivated city fire station, its entryway used as meeting place for the slum's many habitues. Here beer and wine flow as do tales of misery. I guess it didn't remain a training center too long, what with all that flowing going on. If you look closely at the shot below, you’ll notice two chunks of the arched sign aren’t original. 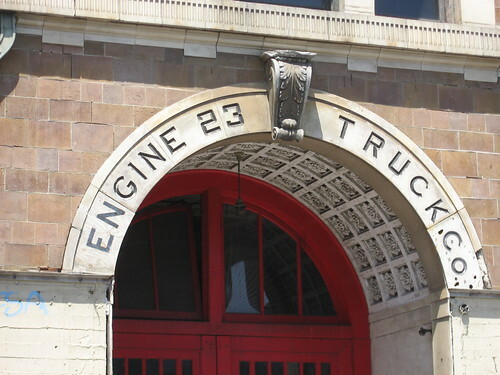 The right side has “CO”, where the original, seen in the black and white pictures here, had a “5”, as in Truck 5. The start of the text, “EN”, looks like paint on a curved piece of plywood. But, whoever did it did a pretty good job. I didn’t notice that plywood until I got back to Big Orange Landmarks Headquarters. 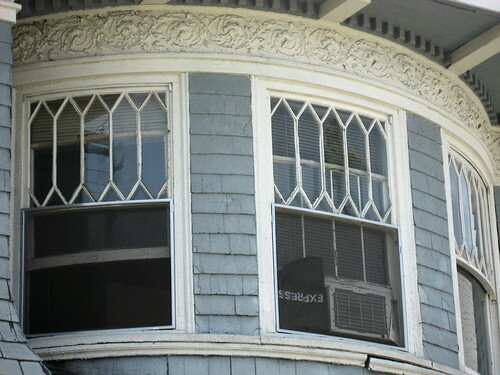 I took the picture below a split second after some guy was standing behind that upper window, giving his arm a scratch and looking at the goings-on down on the street. 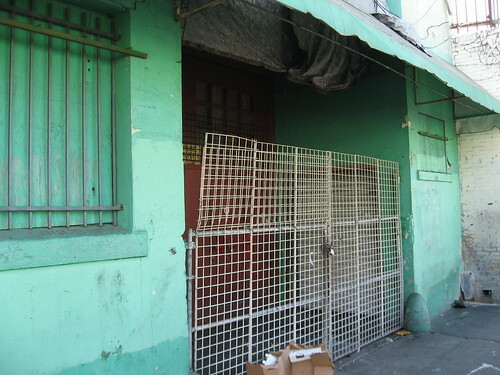 The man must’ve been a squatter, because the building was sealed up pretty tight when I was there. 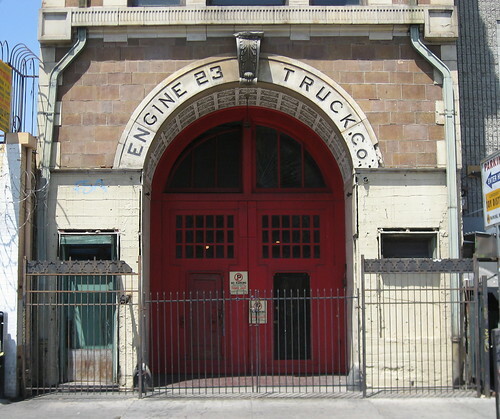 The fire station, close to a century old, is in poor condition. I can only imagine what the inside looks like. 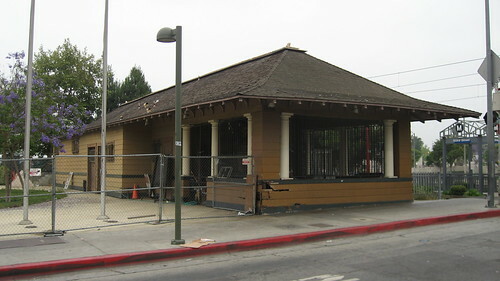 I hope it’s rehabilitated soon, or else I think it’s unlikely the building will see its centennial. 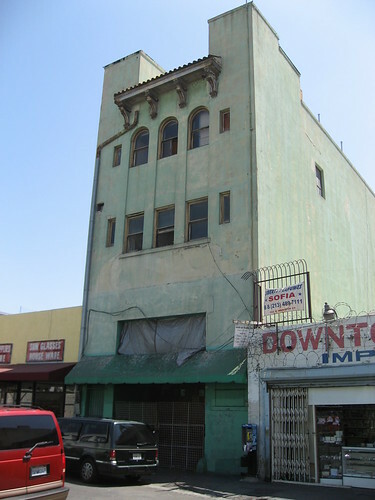 This green portion is the landmark's back, on Winston Street. 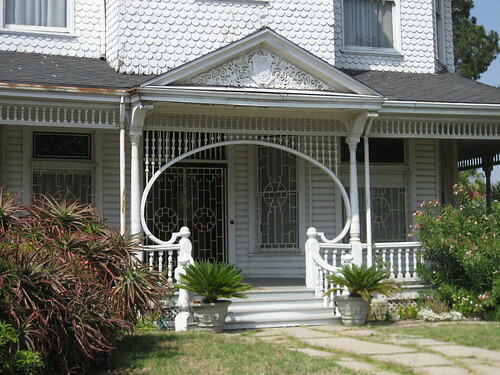 This single-story, clapboard structure, now more than a century old, has seen better days, that’s for sure. 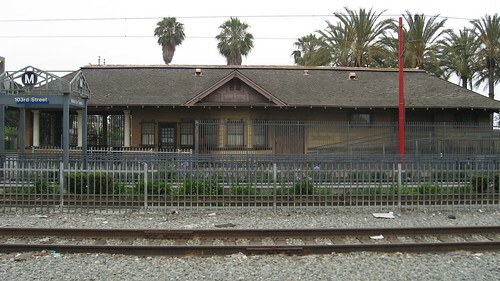 Built in 1904, Watts Station later became a main stop on the Red Car line. When the Red Cars stopped running in 1961, the station boarded the train to Deteriorationville. 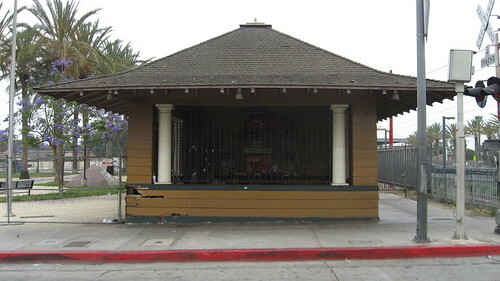 Oddly enough, according to a 1989 Los Angeles Times article, “the train station was the only structure that remained intact when stores along 103rd Street burned during the Watts riots.” That was in 1965. Man, you gotta smack a building pretty hard to get the kind of damage you see on the corner above. Well, if a major civil disturbance that resulted in $35 million in damages and 34 deaths couldn’t do in Watts Station, the 1970s were sure going to try. 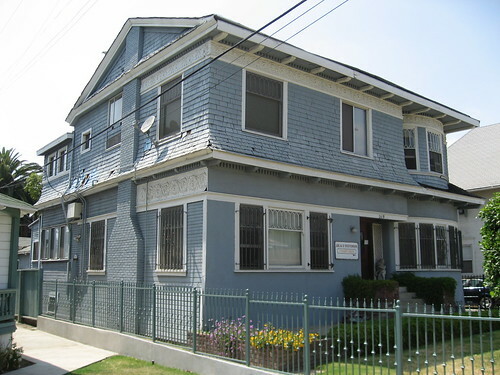 However, thanks in part to a two-decades long campaign led by Watts resident Freita Shaw Johnson, March, 1989, saw the re-opening of the station as what was to be a city Department of Water and Power customer service office and a Watts history mini-museum. 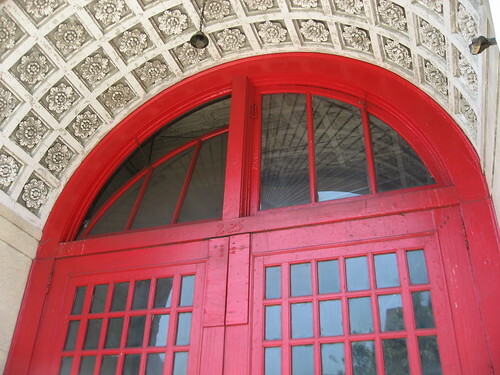 The restoration to the building's original exterior design was paid for by a $700,000 grant from the Community Redevelopment Agency. 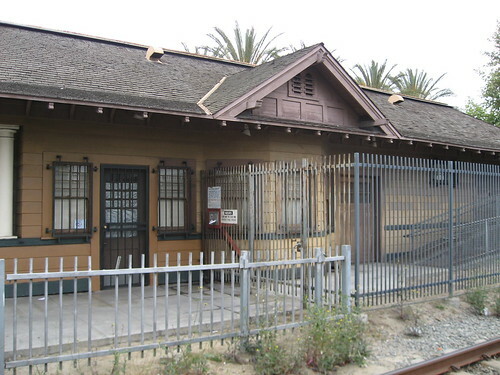 Today the building's part of the Metro Blue Line and is, once again, a train station. Now, it’s easy to complain and shake your head about the shape it’s in, but, on the other hand, I think it's more satisfying that not only is the building being used, but it’s actually in service per the original design of more than a century ago. 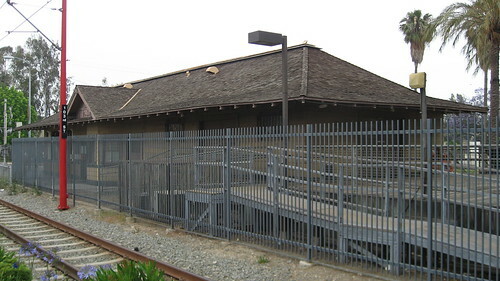 Watts Station was listed on the National Register of Historic Places on March 15, 1974. 1. Stevenson's great-grandfather, Jesse Fell, was the principal founder of the Unitarian Church in Bloomington, Illinois in 1859. 2. His granddad, Adlai Stevenson, was Grover Cleveland’s Vice President. 6. In 1948, he was elected Governor of Illinois by the largest plurality in the state's history. I took this picture not only for the molding and the hexagonal panes, but also for Adlai's ingenuity in the field of air-conditioning installation. 8. He ran as the Democratic choice for president twice, in 1952 and 1956, losing to Ike both times. 9. In 1961, President Kennedy appointed him Ambassador to the United Nations. 10. His books include Call to Greatness (1954), What I Think (1956), Friends and Enemies (1958), Putting First Things First (1960), and Looking Outward (1963). 11. He died on July 14, 1965, on the steps of London’s U.S. Embassy. Not to take anything away from the Queen Anne house, which is nice and all, but you have to consider the designation was more a result of sentiment (the declaration came a month after Stevenson died) than for the building's architectural significance. 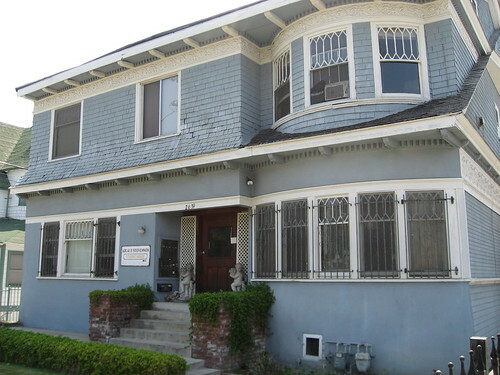 Adlai Stevenson's birthsite is now student housing for nearby USC. So if you’ve already read my posts on HCM No. 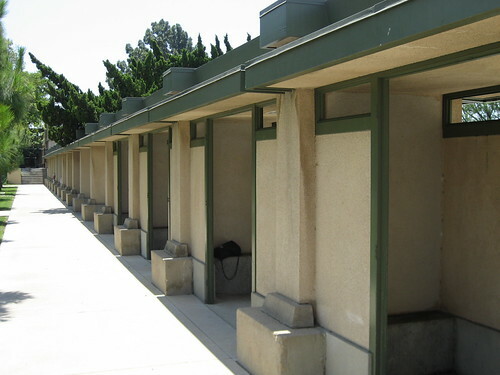 12, The Hollyhock House, and HCM No. 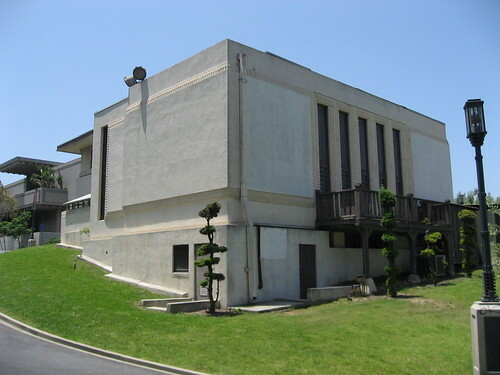 33, Barnsdall Arts Center (Residence ‘A’), you’ll find a lot of repetitive repetition here. 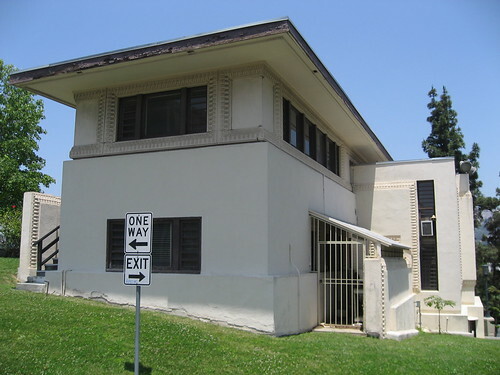 Basically, right around World War I, Aline Barnsdall had intended a large art colony to emerge on her Olive Hill estate in east Hollywood. 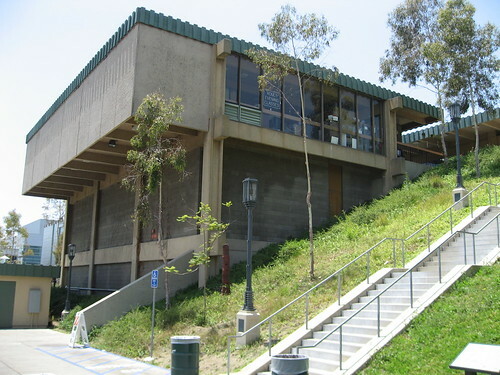 She even had architects Frank Lloyd Wright, Rudolf M. Schindler, and Richard Neutra help her out. For a bunch of reasons, though, the grand plan – which included a movie theatre, actors’ dorms, artists’ studios, etc. – never came together, and Aline gave the park to the city in 1927. 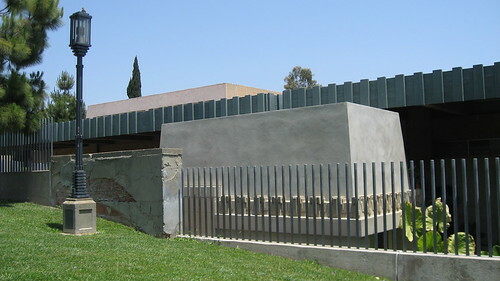 However, the eleven-acre Barnsdall Art Park today does serve as an art colony, with buildings new and old scattered about. 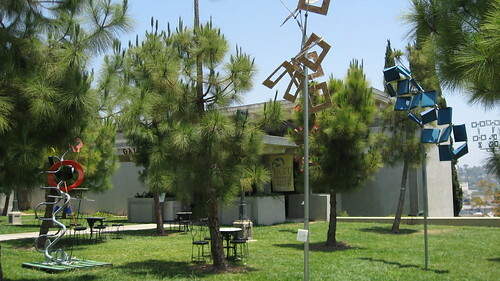 In the shot above, behind those evergreens, is the Municipal Art Gallery (1971 – Wehmueller and Stephens). 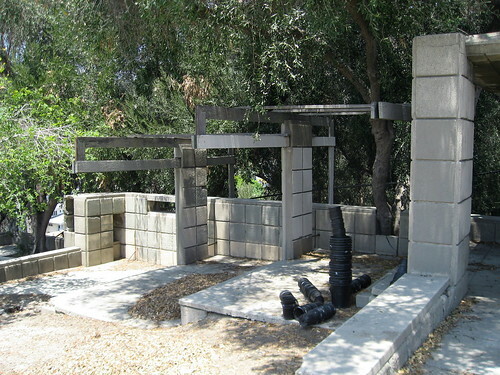 Below is the view of the back of the building, with a kid-created monument from the 1970s in the foreground. 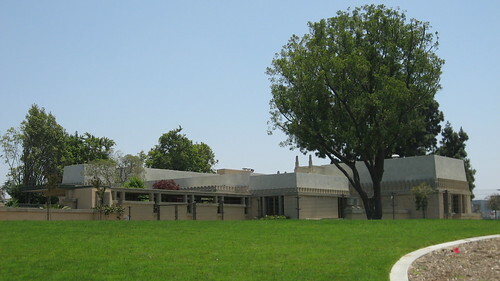 According to Gebhard and Winter’s Los Angeles: An Architectural Guide, the Gallery was built after a “temporary” one designed by Wright, elsewhere on the property, was torn down. 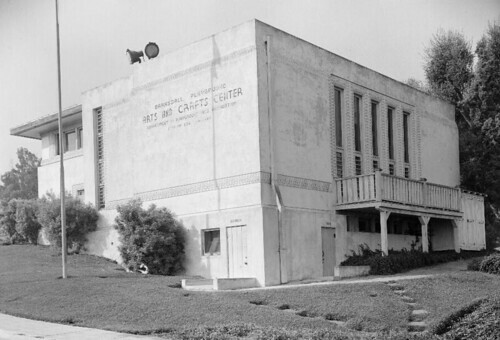 Below is the Barnsdall Gallery Theatre, which, although you can’t see it here, adjoins the Art Gallery. 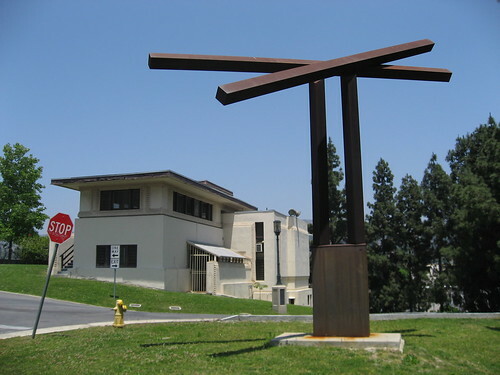 Above is the Junior Arts Center & Barnsdall Art Center (1967 – Paul Hunter, Walter Benedict, Herbert Kahn, Edward Tarrell). 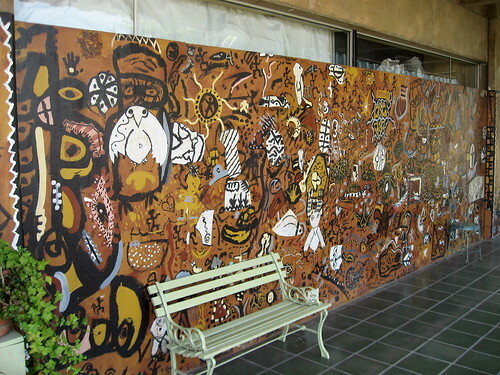 Above and below is a pair of murals found among the Arts Center. 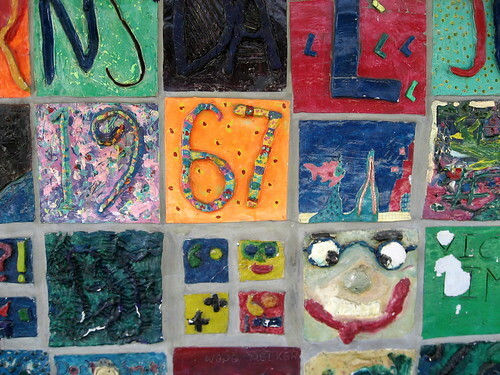 The upper is a 25th anniversary mosaic project overseen by instructor Richard Godfrey. 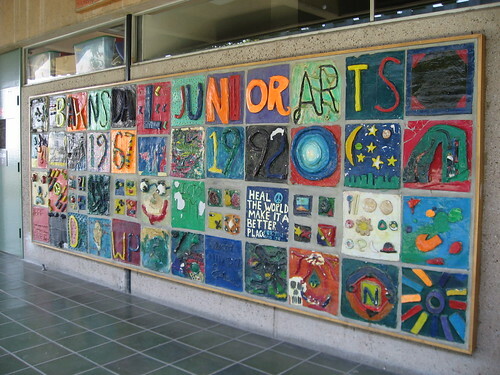 The lower is a 1995 “contemporary cave painting” by muralist Hawley Hussey and more than thirty junior artists of the Barnsdall Jr. Art Camp. The colors were created with spices (it tasted like hell, though). 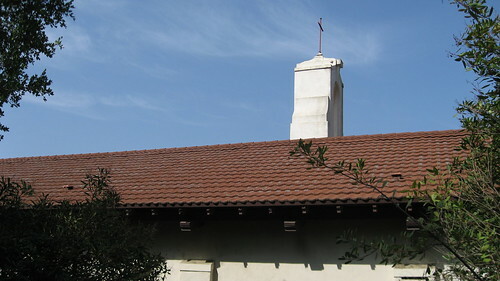 Above is the Spring House, standing in front (behind) of the Junior Arts Center. And below, with Residence ‘A’ in the background, is “Temple II” by Gene Flores, a 1979 work in the memory of Adam Kemper Becket. Above: What do you call this? Is it a fountain? In any case, it’s dedicated to Aline’s pop, filthy rich oil tycoon Theodore N. Barnsdall. 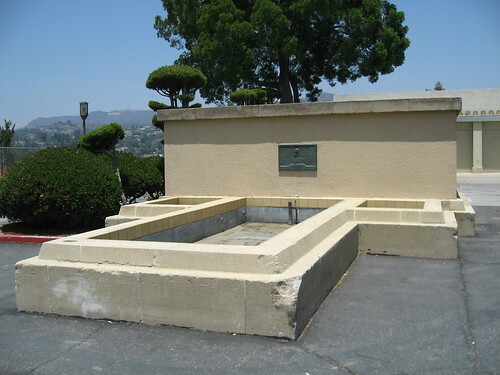 Below: Schindler’s Terrace/The Wading Pool and Pergola (1925 – Rudolf Schindler and Richard Neutra). Or what’s left of it, anyway. Okay, this is something you have when you don’t know what to do with your money. These compartments above were actually built as animal pens. Like a petting zoo. They didn’t serve that purpose very long, and according to an onsite docent, only four of the sections were ever used, although one did hold a llama. This final picture was taken from the parking lot along Hollywood Boulevard. That’s Residence ‘A’ on the left, and you can see just a bit of the Hollyhock House Garage at the top of the hill on the right. Oh. One more thing. 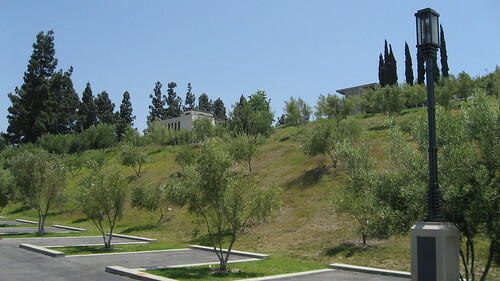 Barnsdall Art Park is located in the officially designated Los Angeles community of Little Armenia, which, according to its MySpace page, is 85-years-old and in a relationship. 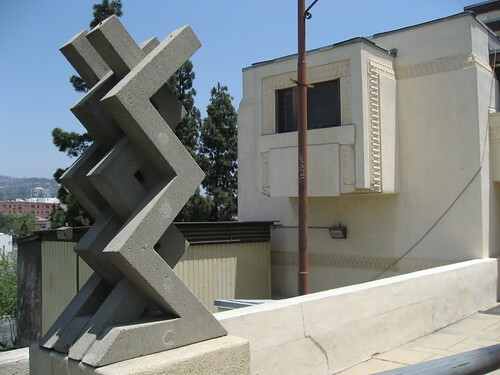 Just a bit more than two years after declaring the Hollyhock House in Barnsdall Art Park a city monument (see this earlier post on HCM No. 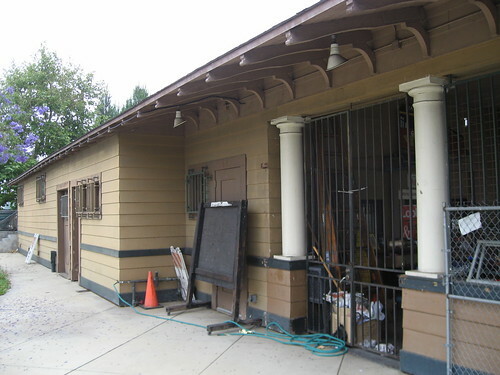 12), the Los Angeles Cultural Heritage Commission gave landmark status to another building in the park, Residence ‘A’, as well as to the eleven-acre park itself. 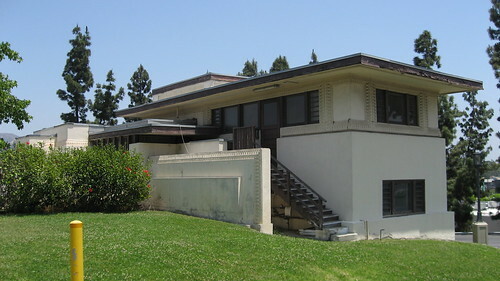 Residence ‘A’ was designed by Frank Lloyd Wright as a guest home for Aline Barnsdall, the woman who proposed the art complex on her Olive Hill land in Hollywood and who briefly used the Hollyhock House as her home. 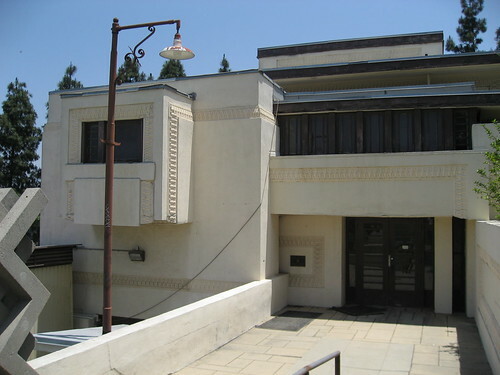 Barnsdall donated the park, including Residence 'A', to the city in 1927. So if you took the EXIT to the right, wouldn't that put you in violation of the ONE WAY to your left? This zig-zaggy artwork is Jesus Y. Dominguez's "Kaleidoscope" from 1971. 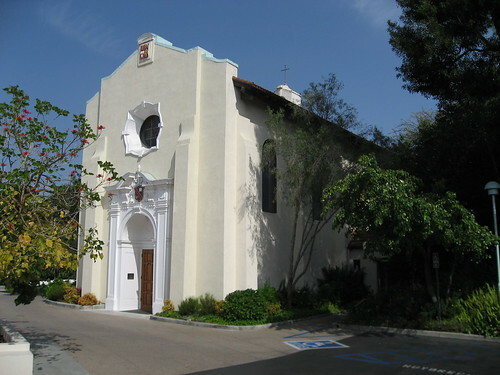 St Saviour’s Chapel was dedicated in 1914 at part of the Harvard School for Boys at its original site down at Venice and Western. 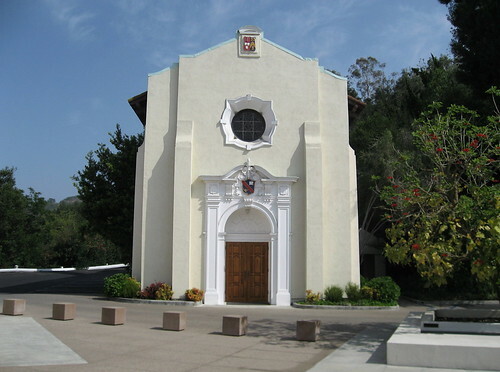 The building, designed by Reginald Johnson, was modeled after the chapel at Rugby School in England. Every source I’ve found mentions the pews which face the center aisle, but since I stopped by on a late Sunday afternoon, the chapel was closed and I didn’t get a look inside. I’ll have to take their word for it. 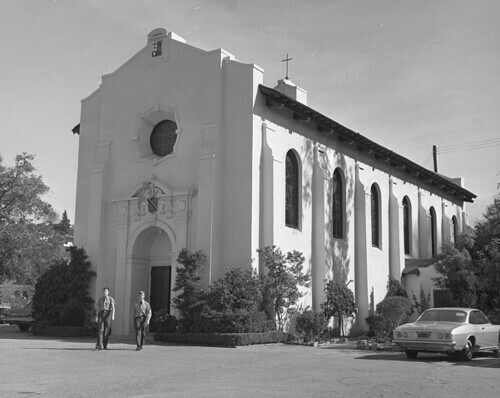 St Saviour's in 1965, courtesy of the UCLA Library Digital Collections. Founded by Grenville C. Emery, the Harvard School for Boys opened in 1900 as a military academy. 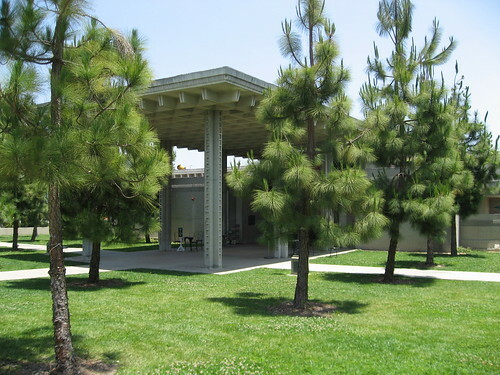 In the 1930s, Douglas Aviation’s Sir Donald Douglas gave the school $25,000, allowing the institution to move to the site of the old Hollywood Country Club, its current home. When the Harvard School relocated to its current site in 1937, the 23-year-old chapel was moved along with it. 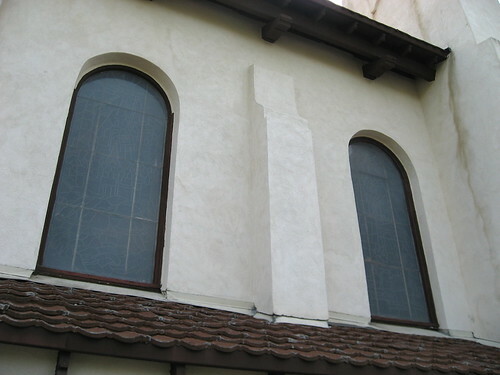 According to McGrew and Julian’s Landmarks of Los Angeles, St Saviour’s was diced into sixteen sections in order to make the journey by the way of Sepulveda Boulevard. 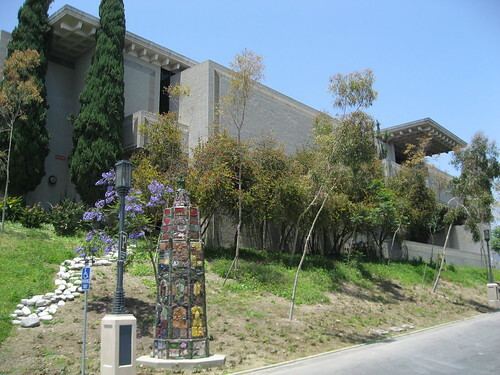 In 1989, Harvard merged with the Westlake School, formed near present-day MacArthur Park by Jessica Smith Vance and Frederica de Laguna in 1904 as an all-female school. 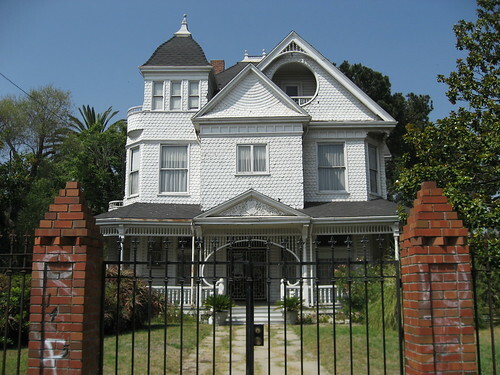 It’s been located in Holmby Hills since 1927. 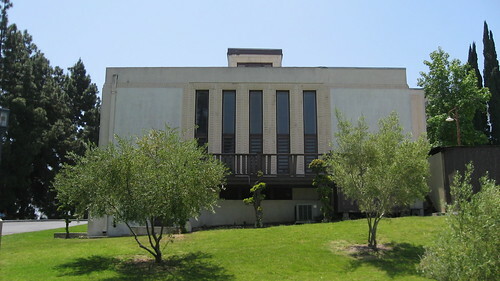 Today, as part of Harvard-Westlake School, grades seven through nine go to the old Westlake campus, while sophomores, juniors, and seniors attend the Sherman Oaks school. (Man, if you need proof how exclusive this school is, their website's URL has just two letters - hw.) Harvard School alumni include Jon Lovitz, H.R. Haldeman, and the Nelsons. 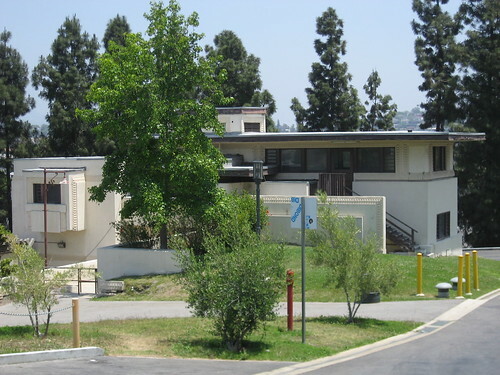 Some of the addresses I see associated with the school list its home as Studio City, others say North Hollywood. Correct me if I'm wrong, but I'm pretty sure it's located in Sherman Oaks.